Tangent circles are coplanar circles that intersect in exactly one point. They can be externally tangent or internally tangent. Internally tangent circles have one circle inside the other. 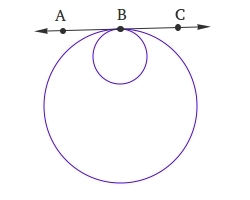 In the image below, both circles share point B as a common point. Therefore, B is the point of tangency. Line AC is called common tangent because line AC is tangent to both the small circle and the big circle. Externally tangent circles are outside of one another. In the image below, both circles share point Y as a common point. Therefore, Y is the point of tangency. 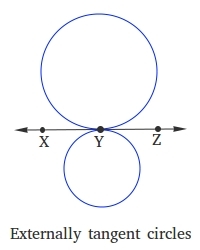 Line XZ is called common tangent because line XZ is tangent to both circles.